Here in Florham Park, NJ, Dr. Carollo and his team approach all restorative dentistry cases with understanding, respect, and the personalized skill your smile needs to regain its full form and function. Whether you’re dealing with relatively minor enamel damage or teeth that are missing altogether, we’ll work closely with you to find a solution that fits your needs and budget while still providing you with the support you need to live life to the fullest without fear of embarrassment or further oral health problems. In cases where a tooth’s structure has been damaged by decay or injury to the point where a filling just isn’t enough, a crown can be relied on instead in order to restore its strength and appearance. This small and customized restoration is used to effectively “cap” off the affected area, and it can also erase cosmetic issues like cracks, chips, and discoloration. 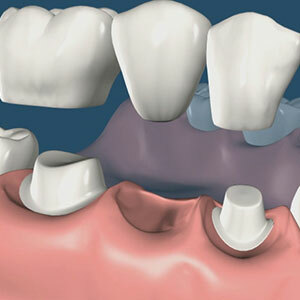 We can provide crowns made from several different kinds of materials, including tooth-colored ceramic. 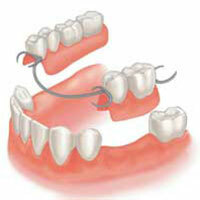 In cases of tooth loss, many patients seek a more durable, permanent solution than dentures can provide. A dental bridge can be used to replace one or more teeth in a row, as long as there are still healthy, existing teeth on either side of the gap. Anchored into place with the help of dental crowns, bridges can provide a renewed sense of stability and lifelike quality to a lacking smile. The process usually requires two appointments at our Florham Park, NJ office: one for slightly adjusting your existing teeth in order to create a base for the new bridge, and one where we precisely place your new restoration while ensuring that it looks and feels natural. 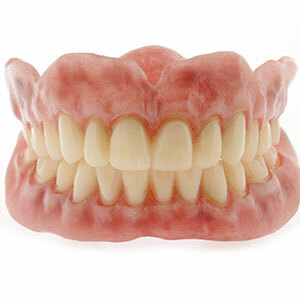 Dentures have been relied on as a tooth replacement solution since the American Revolution, and today, patients still prefer their affordability and easy use over other, more modern choices for treatment. Our full dentures consist of an entire row of teeth in a gum-colored base that is meant to replace either your bottom or top arch. This restoration stays in place with the help of natural suction; some people also prefer to add a little extra stability with the help of dental adhesive. 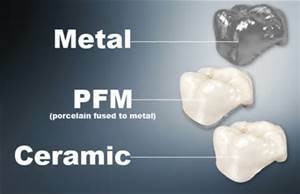 Partials are similar to full dentures, but instead of consisting of an entire arch of teeth, they’re customized to fit the unique needs of the patient, fitting into their existing smile like a puzzle piece. 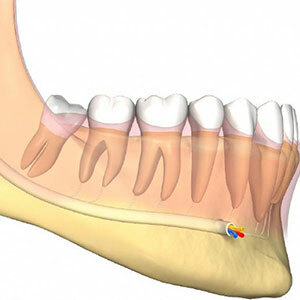 They stay in place inside the mouth with the help of clips. Although partial dentures resemble a dental bridge, they’re removable just like full dentures, which makes it easy to clean them and your remaining natural teeth as well as sleep more comfortably at night. 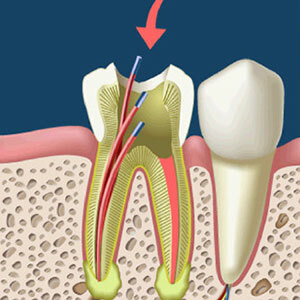 Although many patients become worried when told that they need to undergo root canal treatment, the truth is that the procedure is highly successful and no more painful than receiving a common filling. Better yet, teeth that would have needed to be extracted otherwise due to serious decay and/or damage usually go on to last a lifetime as long as they’re cared for properly! During this procedure, our team will remove infected tissue from the inside of your tooth before thoroughly cleaning and sealing the area. In most cases, we will also need to place a new crown so as to complete the structure of your tooth and restore it to full health. At the office of Dr. John A. Carollo, we can handle the problems wisdom teeth often create for patients in a skilled and comfortable fashion. Although some people do just fine with keeping their smile complete, others experience serious pain and damage due to their wisdom teeth being impacted, meaning that they erupt at an angle instead of straight through the gum line. In these cases, we strongly recommend that you visit our Florham Park, NJ practice so that we can extract them and avoid further complications that may negatively affect your oral health.